It’s one of my favorite stories in the Bible. The day of Pentecost when the Spirit of God comes with a mighty wind and showed herself in tongues of fire over the believers’ heads. They spoke languages they never knew before. People came running to see and were confused by these signs. Some even thought they were drunk. But in the end the Spirit led to the name of Jesus being preached and lives being changed. I love that story. It’s amazing in its detail and scope. 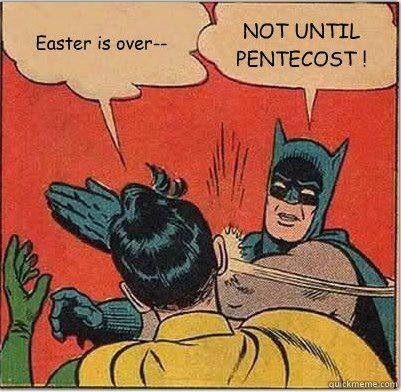 And I think we long for days like Pentecost. I hope you have experienced a time in your life when you’ve recognized the moving of the Holy Spirit and perhaps seen amazing things. And yet our lives are not lived in this place all the time. Most days are normal. Mundane. Average. There is no roaring of wind from heaven or tongues of fire. And maybe I assume that in the absence of such audacious signs that the Spirit is elsewhere – doing miraculous things through incredible people. But is it possible that the Holy Spirit works through us much more in simpler, quieter ways. Could it be that her power can be seen in us in the simple, the average days even without mighty winds or miraculous fire? After all, none of the fruits of the Spirit Paul lists in Galatians — love, joy, peace, patience, kindness, goodness, faithfulness, gentleness, self-control — are audacious. Most are mild and quiet. But all are unmistakeable. So this week we celebrate bold, awesome ways in which the Spirit shows up while searching for the simple and humble ways as well. Because if you are in Christ, you have a great power within you. May we see it clearly this week. When you supply it, they gather it. But if you turn away from them, they panic. and trust instead in human strength. into people of power and grace. that I may be a person transformed into the likeness of Jesus. May others be blessed to see the work of your Spirit in my life. This entry was posted in Pentecost and tagged holy spirit. Bookmark the permalink. We will definitely continue to keep Sacred Margins going even after I move to Oklahoma. This is such a blessing in my life and am honored that you continue to read and follow with us. Love you too and will miss everyone here so much!